Father J. Joseph McNally, a retired diocesan priest, died of complications from brain cancer on Oct. 10 while receiving hospice care at Columbus Regional Hospital in Columbus. He was 80. The Mass of Christian Burial was celebrated on Oct. 13 at St. Barnabas Church in Indianapolis. Bishop Christopher J. Coyne, apostolic administrator, was the principal celebrant of the Mass. Father John McCaslin, pastor of St. Anthony Parish in Indianapolis and administrator of Holy Trinity Parish in Indianapolis, was the homilist. Nicknamed “Father Mac,” he is remembered by those who knew him as being very generous, loving and pastoral. Quick to share his smile and laughter, he loved fishing, traveling, playing golf, relaxing at his cabin at Prince’s Lake, spending time with seminary classmates, cheering for the University of Notre Dame’s football team, and celebrating all things Irish. “May the road rise to meet you,” an Irish prayer attributed to St. Patrick, was one of his favorite blessings. Bishop Paul D. Etienne of Cheyene, Wyo., a former diocesan priest, posted a tribute to Father McNally on his online blog on Oct. 10. As the second pastor of St. Barnabas Parish, Father McNally was “very committed to stewardship as a way of life,” Father McCaslin said. “Father Sciarra had started the parish on that [focus on stewardship], and he worked very hard to keep it that way, … continuing to provide Catholic education that was funded through parish tithing instead of tuition” for students at St. Barnabas School in Indianapolis. “When he went to the emergency room at Methodist Hospital a few weeks ago,” Father McCaslin said, “I went to see him and anoint him. Right there in the emergency room on a little table beside him was his Breviary. His faithfulness to daily prayer was a reflection of his commitment to priestly life. That was very much at the heart of who he was. Prayer was critical to him, and he remembered to take his Breviary. St. Barnabas parishioner Karen Oddi of Indianapolis, archdiocesan associate archivist, served as coordinator then director of religious education at her parish during part of Father McNally’s 13 years of ministry there. During his homilies, she said, he would often ask the parishioners to think about how they treat the people that they love the most. Father McNally was a talented carpenter, she said, who built and installed beautiful cabinets at his lake cabin. John Joseph McNally was born on Feb. 29, 1932, to John P. and Mary A. (Trouy) McNally, and was baptized at Holy Cross Church in Indianapolis. When he was 3 years old, his father died and his mother moved to New Albany with her three young sons. He attended St. Mary School in New Albany. He was confirmed by Bishop Joseph E. Ritter on Oct. 30, 1939, at St. Mary Church in New Albany. After receiving priestly formation at Saint Meinrad’s minor seminary and School of Theology, he was ordained a priest by Archbishop Paul C. Schulte on May 3, 1958, at Saint Meinrad’s Archabbey Church of Our Lady of Einsiedeln in St. Meinrad. He also earned a master’s degree in counseling and psychology at Spaulding University in Louisville, Ky.
Father McNally was instrumental in the founding of the South Central Indiana Hospice Program in Columbus. He also was an ardent supporter of Catholic education for all students regardless of family income. In recognition of his service to the Church and several communities in Indiana, he was named a Sagamore of the Wabash, the highest honor presented by the governor. Father McNally celebrated his first holy Mass on May 4, 1958, at St. Mary Church in New Albany. His first assignment on May 20, 1958, was as associate pastor of Our Lady of Lourdes Parish in Indianapolis and an instructor at Father Thomas Scecina Memorial High School in Indianapolis. On Aug. 23, 1963, Father McNally was named associate pastor of St. Margaret Mary Parish in Terre Haute, and also taught religion at the former Bishop Schulte High School in Terre Haute. Five years later, on June 1, 1968, he was appointed associate pastor of St. Paul Parish in Sellersburg and student director of Our Lady of Providence High School in Clarksville. Father McNally was named to his first pastorate on Aug. 17, 1971, at Most Sacred Heart of Jesus Parish in Jeffersonville. 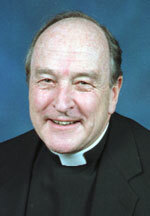 On July 20, 1977, he was appointed pastor of the former St. Columbus Parish in Columbus. Father McNally began his service on the archdiocesan board of consultors on Jan. 1, 1989, a position that he held until June 30, 1994. On July 8, 1987, he was named co-pastor—with Father Patrick Harpenau—of St. Columba Parish and St. Bartholomew Parish in Columbus. At that time, he was also appointed moderator in the exercise of pastoral care with residence at St. Columba Parish. Three years later, on July 5, 1989, he was named pastor of St. Barnabas Parish in Indianapolis, an assignment that he continued until his retirement on July 1, 2002. During his retirement, he continued his sacramental ministry part time at parishes in central and southern Indiana. Surviving are two sisters-in-law, Kathleen McNally of Franklin, Tenn., and Mariam McNally of New Albany, as well as several nieces and nephews.